With his movie living up to the old jingle "When Captain America throws his mighty shield, All those who chose to oppose his shield must yield" there's no better time then now to deck yourself out in gear featuring Marvel's star-spangled Avenger. Over at Crazydogshirts the crew is even coming to the party by taking a whole fiver off the cost of two of their crazy cool cap shirts - the iconic 'Captain America Lives' or the Cap and his Amazing Friends-ish number - for those who like a little Falcon and Black Panther mixed into their sheild-slinging action. While they won't instantly take your bod to Greek adonis levels like that sunbed Steve uses in the blockbuster film, they will do the next best thing. And to get one (and your five bucks off), all you have to do is use the code ICEPOP when you order from crazydogtshirts.com by clicking on either one of the shirt titles above! 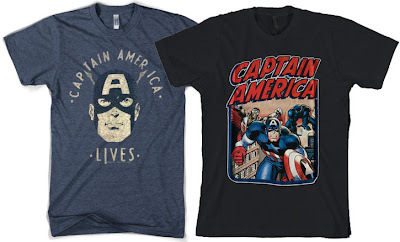 i remember once having come across a "Captain America For President" t-shirt. i love to find that one now! There's a store called Steve and Berry's that carries or carried that same shirt. Other wise try graphictees.com or Old Navy. That would be awesome Dave! I don't think I have seen that one yet, but the places Dale suggested seem like pretty good spots to try.